2000 Days in a Row at Disneyland! Disney Magic Grandma found a fascinating news article. There is a California man who has gone to Disneyland for 2000 days in a row. Can you imagine?! How awesome would that be?! It's funny though, Mr. Disney Magic and I were trying to make ourselves (ok, mostly me!) feel better about coming home from our trip, knowing it would be a while before we got to go back . One of the things we said is that it's nice we can go often enough that things change, but not so often that it gets tiresome. I suppose though, if you just did a single part of the park each day, and never tried to do it all it wouldn't lose it's appeal too fast. While I'd like to think I would never get tired of being at Disney World, I'm not sure! I probably would love trading pins every single day, and sampling all those yummy treats. What do you think? 2000 days in a row for you? You can go here to read the news article! ​There are a lot of ways to put a stop to your summer fun. I'm sure we've all experienced the melt downs, the crankies, the things we forgot to bring, but all those things we manage to get though somehow. It's the big things that really can ruin the day, and we're here to tell you what it is, and how easy it is to prevent! If you've ever been to a theme park or any sort of outdoor play place, especially in the summer you know how hot it can get! There's too much concrete, not enough trees and the air conditioning is usually just inside the gift shops and restaurants. It doesn't take long and you start to sweat. A little while later you might get a headache, or a little dizzy. Sometimes it's hard to breathe and your skin starts to get red, even if you put on sunscreen. You keep walking and you start to feel really worn out and maybe a little sick to your stomach. My friends, that's not a good thing. Those are actually the symptoms of over exposure to heat. Sunstroke or heat stroke is it also called. It happens very often because it creeps up on you, and any of those symptoms above are actually the number one complaint that the first aid stations at theme parks hear. The worst thing is, heat stroke is pretty preventable, because overexposure to heat starts when someone gets dehydrated. There's a simple way to keep all of that from happening to you so your day of fun doesn't get cut short. Drink. Lots. Water is the best, but if you like it flavored, or you want tea or juice, that's okay, just drink! One bottle a day isn't going to cut it and it's not safe to skimp on your water just because it can be expensive to buy. 1. Bring a refillable water bottle. They make some that collapse or have filters. 2. Ask for a cup of ice water. I've never been anywhere that has fountain drinks and wouldn't give you one for free. Dehydration can happen slowly! It's easy to not think about drinking when the morning air isn't too hot, and there are a ton of rides to go on of the perfect spot to claim at the beach before the crowds hit. Sometimes you just don't realize how thirsty you are until dehydration hits. Did you know that you can even get dehydrated while you are swimming? That's why it's so important to make yourself, and your kids, stop and drink, even while playing in the water. Those are all such common things we feel day to day, I suspect we are all guilty of thinking we will just grab a drink later since we don't feel too bad, and then get so distracted and busy, later doesn't come for a while. As serious as these side effects can be for adults, they can be deadly for children, so make sure whatever the age of your child, they have frequent access to liquids. For older kids, they might not always say when they are thirsty, and sometimes don't want to stop having fun for something boring like a drink break, so remind them to drink. Younger children might need constant access to a sippie, and for the smallest ones in diapers, if they don't have heavy wet diapers every few hours like they would at home, they are probably not getting enough hydration. Isn't it funny how something so simple can put a stop to your summer adventures? Keep an eye on everyone, and remember to keep plenty of fluids in you so you can have fun all day, not find yourself in a first aid clinic wondering what's going on! 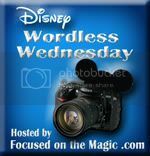 Today's Wordless Wednesday link up from Focused on the Magic is focusing on SUMMER!! Since we just got back I couldn't think of a more perfect picture. This was our first time going to Epcot, and while I had read about the shaved ice in the Japanese Pavilion, it was an absolute shock when we were given piled sky high mounds of ice covered in four flavors. (We got rainbow) It started melting quickly, otherwise I think it would have been higher in the photo, which doesn't do it justice at all. rainbow had four flavors, melon (which my oldest didn't like), tangerine, I think cherry and I can't remember the other flavor. I'm hoping that the photos Mr. Disney Magic took with his phone end up on my computer soon, so I can see if he got a better one. The official name for this is Kaki Gori, and it's one snack credit, or around $5. You can also get sweet cream in it, but we just opted for plain. ​Mr. Disney Magic discovered this first, with a free episode on the history of Adventureland (I think it was) on Amazon Prime. When I found the podcast, I was over the moon! Lou Mongello seems to know everything about Disney. The history, the behind the scenes, everything. What make's part of that so interesting, is that he had been a lawyer, closed his practice and moved to Florida to do what he loved best, Disney. He also raises money to send kids to Disney, through the Make a Wish Foundation, and I have to say it, honestly has one of the best voices for radio I've ever heard. Dis Unplugged is another great place, and what I like about their podcasts I only discovered recently. In addition to their regular podcasts on the topics I mentioned above, they also have an addition different podcast that's a spin off just on the historical side! They also have a specific podcast genre for Universal, Disneyland, Disney World, popular Disney culture, and more. Each is it's own separate podcast, so for example, those just wanting Disney World info of history, aren't going to be listening to the top 10 places for lunch at Disneyland. There's a pretty big team of people doing the podcasts, so you don't always get the same group each time. They have so many podcasts, there is bound to be something (or a dozen somethings) that matches your interest! ​I haven’t listened to as many of these podcasts, so I don't have as much to say, but they also have been good general information sources, as well as a lot of listener question episodes, so you never know what you will get with those, they might be questions you have as well, or ones you'd have never thought to ask. This is another one I haven't listen to much, there aren't as many podcasts on here, and it seems to have a lot of trip reports, sprinkled in with some other info, but sometimes trip reports are really useful for when planning your own trip, especially a first trip, that's why I included it. I am sure there are tons more Disney podcasts out there, these are just my favorites of the ones I've run across. Do you have any you could suggest to me?